Last week we spent a day in Yosemite with Nate’s parents. (It was beyond breathtaking, by the way.) On the way home, we drove through California’s Central Valley (you know, one of the world’s best spots for growing food). We passed acres and acres of fields and orchards. On the particular road we were on, there were a gazillion almond trees. Here are a few unripe almonds from some of those trees. Aren’t they pretty? None of us had ever seen an almond tree. We were intrigued. You could tell the fruit was in its early stages and Nate’s mom, Pat, was dying to hop out of the car to get a closer look. We finally found a spot where it was safe to pull over. As the car came to a stop, we noticed a “Beware of Dog” sign on a fence surrounding the orchard’s farmhouse. It was a few yards off and we kind of figured it was more of a sign to scare people. Nate’s mom hesitated before getting out, but we told her, “It will be fine. Go ahead!” So, she hops out of the car and walks to the nearest tree. As her hand reaches out to feel what the almonds are like, we suddenly hear barking. We are all surprised. Yeah, we saw the sign. But still. Really? There is an actual dog to beware of? Nate’s mom sort of starts to panic. With only inches to go before her hand will reach the forbidden fruit, we all see it. The dog. It’s small, but scrappy, and has a fierce bark. And he’s running our way. Fast. Pat tears for the car, all the while yelling, “I’m just going to look at them! I’m not picking them!” For some reason, the dog didn’t listen. Did you know that mini van doors close slowly? Well, they do. Thankfully, it closed just before the dog got to us. As we drove away, laughing hysterically, I asked Pat, still recovering with adrenaline coursing through her veins, what the almonds felt like. “I don’t know, I didn’t even touch them!” Of course we laughed harder. A mile or two down the road we saw a fabulous produce stand, surrounded by almond trees. We stopped to buy some nuts. Nate and Pat recounted the close call with the dog to the woman who owned the market. She told them they were more than welcome to look at her almonds and even pick a few to look at more closely. She wouldn’t even sic any dogs on us. 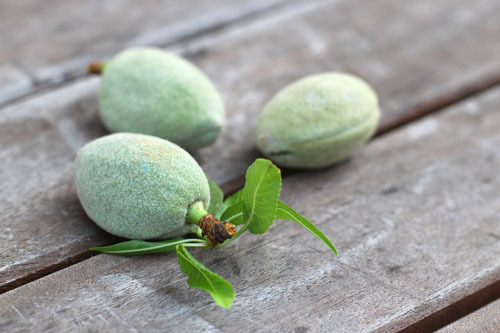 Thanks to Pat’s persistence and bravery, we all got a close-up look of an early-stage almond. And we all learned a lesson. If an orchard has a “Beware of Dog” sign, probably best to beware! Growing up my mom would always make the best butterhorn rolls for the holidays. The recipe came from the Better Homes & Gardens cookbook, I believe. Once I was off on my own I followed what I thought was the same recipe in my version of the same cookbook…but they never quite tasted the same. Then, one year, my mom was looking at the recipe and she noticed they had actually changed it in the newer version of the cookbook. No wonder! But, since we’ve made that discovery, her cookbooks have been packed away in a storage unit and I haven’t been able to get my hands on the recipe. Last Thanksgiving, our friends Peter and Nikki invited us over for Thanksgiving and took on the task of making homemade rolls. 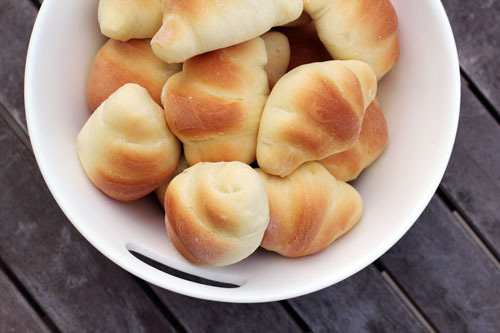 Their crescent rolls (which I guess are the same as butterhorn…I have no idea!) were DELICIOUS…better than mine, definitely rivaled my mom’s. Who knows, it might even be the same recipe that my mom used to use! Until that old Better Homes and Gardens cookbook sees the light of day once again, I’m sticking with this recipe from Nikki. P.S. This recipe is easy enough that I always end up making at least one more batch a day or two after whichever holiday we’ve made them for. We just can’t get enough and I don’t mind making them one bit! Mix all the ingredients except the flour in your KitchenAid mixer with the paddle attachment or with your beaters. Slowly mix in the flour. Knead dough or mix on speed 1 or 2 with the dough hook on your KitchenAid (when I knead with the KitchenAid I let it go about 5 minutes). Let rise to double in size in a bowl, about an hour or so (cover the bowl with a light, clean towel and let rise in a warm/non-drafty place). Punch dough down. Divide into two. Roll each piece of dough into a large circle, that is quite thin (1/8”³ – ¼”³). 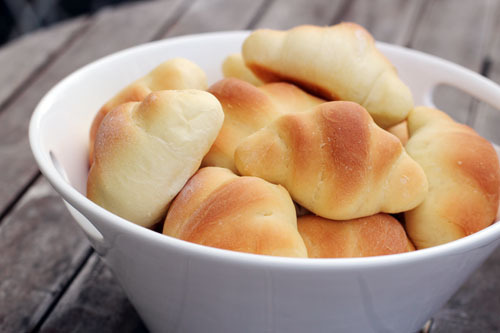 If you like a buttery flavor, brush melted butter onto the dough at this time, although they are great either way. Cut the dough like pizza into 16 pieces (you will end up with 32 rolls total). Roll each piece from the large end of the triangle and place on an ungreased cookie sheet or a silpat-lined cookie sheet with the tip tucked down and under the roll. Let rise again until about double in size, or about an hour or so (cover the rolls with a light, clean towel and let rise in a warm/non-drafty place). Bake at 375 for 12 minutes or until browned on top and bottom. Note: See comment #4 below – my mom found her recipe and posted it here! 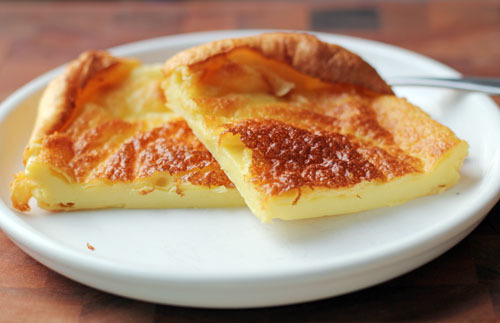 It’s VERY similar to this recipe, just a little bit different proportions. A while back I shared a video showing how to make 60-second Brussels sprouts (thanks once again to my culinarily-geniused friend Lindsay for sharing that with me so long ago). 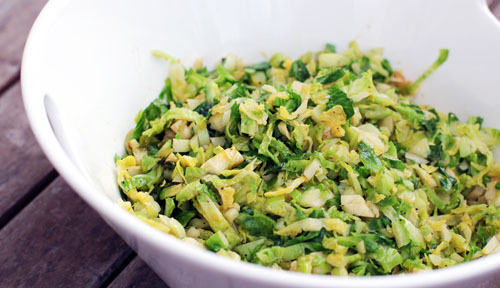 The idea behind the recipe is that you slice the brussel sprouts thinly, allowing them to cook quickly (hence the 60 seconds), which keeps the sulfur from emerging and stinking things up. Nate’s parents were here for Easter and Nate’s dad loves Brussels sprouts. Pat was telling me how her niece Morrigan recently roasted Brussels sprouts with maple syrup, and that they were deeeeee-licious. I then told Pat about this quick cooking technique, which she had never tried. We decided to combine the two ideas and created a very delicious side dish for our Easter feast last week. It’s quick, it’s easy, and the subtle sweetness of the maple syrup complements the flavor of the Brussels sprouts really nicely. I may never use lemon again! 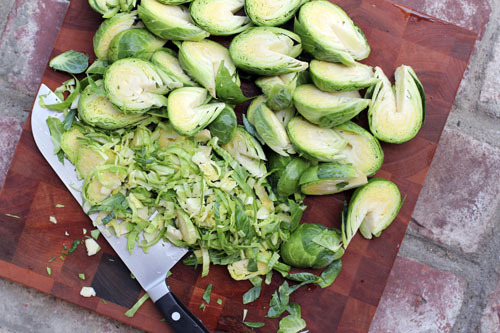 To see how to prepare the Brussels sprouts, click here and watch this handy dandy video. 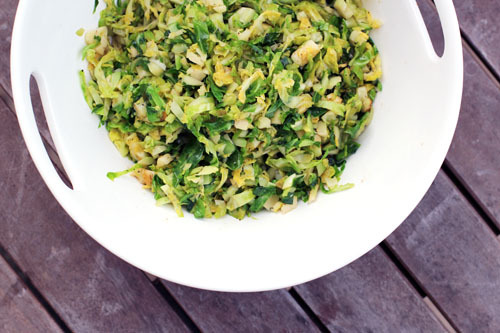 Here’s what you do in words: cut the Brussels sprouts in half lengthwise, cut out the core, then thinly slice the sprouts, so it looks like sliced cabbage for coleslaw (see photo above). Heat the olive oil and butter over high heat in a large skillet, preferably with high sides. Once the pan is hot, add the maple syrup, stir quickly, then add the Brussels sprouts. Cook them for 60 seconds, stirring throughout the cooking time. Remove from heat, season with salt and pepper, then serve immediately. Happy Belated Passover and Happy Easter! Nate’s parents just drove off to the airport after a completely perfect visit this week. We celebrated Easter in all its glory yesterday and it was a wonderful day full of delicious food and even better memories. Nate’s mom always has a million fun tricks up her sleeve. 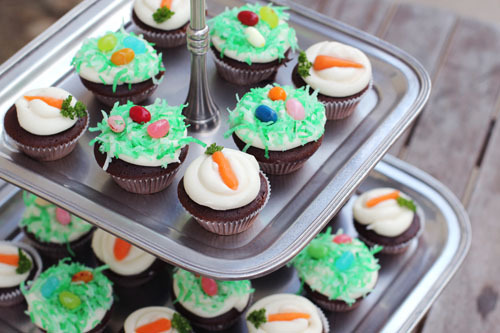 One of the many this week was decorating Easter cupcakes. We made mini cupcakes, so for these cute carrots, she sat down with Cate and actually cut up mini carrots into even minier, perfectly shaped carrots to decorate the cupcakes with. The green carrot tops are curly parsley pieces. They were complete adorable (although we noticed this morning they don’t really last over time…mental note!). For the nest cupcakes, she mixed green food coloring with coconut and then had Cate dip the frosted cupcakes into the coconut, finishing the nests off with a few eggs (i.e. jelly beans). This is just one of the many reasons grandmothers are magical. Time for a menu already? Wowzah. This week is not going to be fancy. I have a lot of work coming up, we’ll be getting back into the school groove after spring break, and, well, we have oodles of ham to get creative with. Thank you all each week for sharing your menus – it’s wonderful! Can’t wait to see what you have planned for this week! And, if you’re making and/or eating an Easter feast today, happy cooking and enjoy! Today we are going to have a debate. Aren’t you so excited? You know that icebreaker game where you share two truths and a lie? One of my truths is always that I have never eaten a flavored chip. The sight and smell of such salty snacks pretty much grosses me out. Topic: Jane Maynard has never eaten a flavored potato or corn chip. Jane has never eaten Doritos, BBQ potato chips, sour cream and onion nastiness, Cheetos or any other similar crispy snack with unnatural colors and/or flavors. Jane has never eaten Pringles, plain or flavored. Mashed potatoes have no business being made into chips. If a chip or corn chip has seasoned salt or pepper applied, this does not count as a flavored chip. Exhibit A: The picture above. Do those chips look flavored to you? I think not. Chips with seasoned salts count as flavored chips. Jane has in fact eaten the homemade potato chips at Tacone that are seasoned with a salty-sweet seasoning and corn chips at a Mexican restaurant in Phoenix with a similar seasoned salt applied. 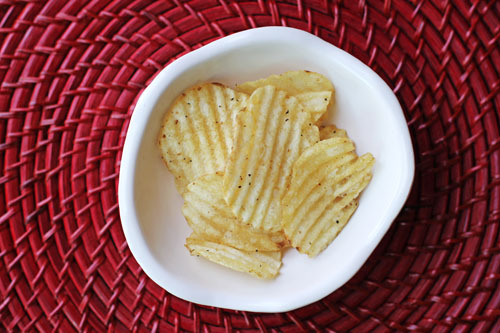 Jane is addicted to Kettle brand Salt & Fresh Ground Pepper krinkle potato chips. These delightfully spicy snacks are most certainly grouped into the flavored chip category. Rebuttals: Not allowed (mostly because I can’t think of anything else to say on the matter). So, what do you think? Can I still use this statement as one of the truths in the two truths and a lie game, or am I just living a lie? For the record: No matter the result of this debate, I will never eat Cheetos! Or Doritos! You can’t make me! …all I can think about is the BABY BOY that will be born to our family in September! That’s right, it’s a boy! The girl streak has been broken! And Cate was right all along. First off, I’m addicted to Yorkshire Pudding. Addicted, I tell ya. Plus, they re-heat so well. 1 minute in the microwave, then a minute or two in the toaster oven to crisp them up. Heaven. Secondly, thank you all for your absolutely wonderful Kitchen Disaster stories this week. And, please, pretty please go read through my list of favorites. It’s a perfect weekend read…or anytime read, really. My mom told me yesterday she actually read every single comment and was dying laughing the whole time. I put that handy dandy list together for you assuming you might not be as crazy as my mom and me to sit down and read a bazillion comments. Thirdly, my in-laws are coming to visit this week. WOO-HOOOOO!!! People don’t believe me when I say I love my in-laws. I really do. I could live with them. Seriously. When we planned their trip, we didn’t realize that they fly home Easter morning (whoops! ), so we’re having our Easter celebrations on Saturday. We’ll be writing a little note to the Easter Bunny to see if he/she/it can come a day early. I hope he/she/it will oblige! – Leftovers! Which makes for a nice, relaxing Easter for me! Your turn to share your menus! It’s a special week – Passover and Easter. I can’t wait to see what you’ll be eating! If you have any recipes to share with us for either holiday, please do!!! Pregnancy update: Sickness is abating. I only had to take my medicine 3 times this week. We’re almost back to normal! AND…we find out in two days if the baby is a boy or girl! Now’s the time to place your bets! Kitchen Disaster Follow-Up…and the Pampered Chef Giveaway Winner! The Kitchen Disaster contest is OVER. But before I get to results, a few lessons learned after reading ALL of your comments. Yes, I think most of these lessons we already know. But given the sheer number of disasters that were shared pertaining to one of the following topics, I think we could all use a refresher! Eyebrows, arm hair, bangs and eyelashes are flammable. Baking soda is different than baking powder. Salt is different than sugar. Garlic cloves are different than garlic bulbs. And, last but not least, powdered sugar is different than flour! Fire, fire and more fire. Don’t know what the lesson is. Just know there was a lot of FIRE. I recommend an extinguisher for your kitchen. Boxed Mac & Cheese does not require water. Okay, it does for boiling the noodles…but then a colander is highly recommended! Blenders have lids for a reason. However, blenders with hot contents will blow those lids to Kingdom Come. BBQs should not be placed right next to your house. Things can and do explode in common cooking. Eggs, potatoes, eggplants, baking soda & maple syrup, glass pans coming into contact with the opposite temperature, and, everyone’s favorite exploding kitchen item, pressure cookers! Water and hot oil do not mix. Measuring utensils ARE in fact labeled, and said labels should be used! Popcorn is dangerous, no matter the cooking method. Birds don’t eat hard-as-rock bread, either. Impressing boyfriends and cooking do not go hand in hand. When a recipe goes awry, people are often scarred for life…and never make that recipe again, no matter what! Metal really should not ever go in the microwave. Cooking a turkey is often more trouble than it’s worth. Kitchen disasters often result in fond family memories for years to come. And, the best lesson of all? If you burn your kitchen down, you get to remodel! Surprisingly, only two stories out of the over 400 shared had to do with cutting oneself while using a knife. Although, now that I’ve said that, the knife stories will probably come pouring in! I know you all have lives and things to do. But, for real, I picked out the very best stories for you. These stories were either the grossest, most surprising, scariest or just plain funniest of the bunch. I’m sure I’m missing some. And I did enjoy every comment I read. But, really, you HAVE to read these. Thankfully the comments are numbered, so click here to go to the original post and scroll down to these goodies. I did think of two more disasters of my own that I have to share. The first is when I was pregnant with Cate and sick as a dog, I had made some Rice Krispie treats. It was the only thing that sounded good that night. For some reason I was moving the pyrex casserole dish I had put them in and dropped it on the hard floor. Of course it shattered. And I started SOBBING. Literally. Our friend Dave Findlay was over with Nate. They both drove to the grocery store to get me new Rice Krispies. What sweeties! This one is definitely a confession. I put a cupcake recipe on this blog. And I put Tbsp. instead of tsp. And some poor unsuspecting soul followed what I wrote. And she had a major cupcake disaster on her hands. I fixed the recipe stat and emailed her and apologized…but never heard from her. I think she hates me. With good reason! ALRIGHT…on to the contests. First off, I did NOT win the $3500 shopping spree. But I came in a close second, so they’re sending me a consolation prize. So, THANK YOU ALL for your wonderful comments and being so supportive and helpful! Melissa, who continued on with the fire theme by sharing the following: Ha! These are great! Thinking about it, all of mine involve fire! Yikes! The worst would have to be when I was in college, though. I was getting ready for class and I stuck a pop tart (I know!) in the toaster to take with me on my way out the door. I went back into the bedroom to get dressed, when I smelled something burning. Sure enough, flames were shooting out the top of my toaster. I quickly unplugged it and took it outside onto my concrete steps, where I poured a glass of water over the whole thing. Not my finest moment, but at least I didn’t burn the place down! Congratulations, Melissa! I think you’ll really love the pizza set…I’ve heard their pizza stones are fabulous! Thanks again to everyone who participated and took the time to share such fabulous stories! And big thank you to The Pampered Chef for such a fun contest and great giveaway! I officially have my first item from a CSA bag that I have never eaten before. 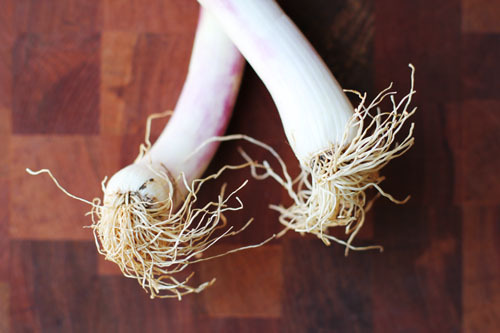 And the winner of this coveted title is…green garlic. I felt like I had to get it. After all, the farms where my produce comes from are in an area that is the garlic capital of the country. 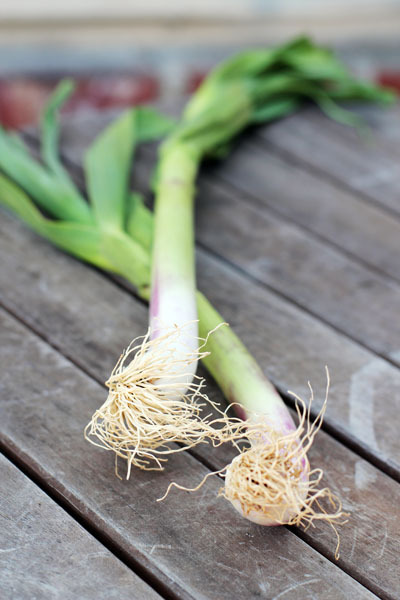 Green garlic is essentially young garlic that is often pulled by farmers to thin out the crop (although also harvested on purpose as it gains popularity). Green garlic has a milder flavor than garlic and is, apparently, delicious. So, what am I gonna do with this here green garlic? I don’t even know what it will look like when I cut into it! I’m thinking I might chop one up and sauté it with the asparagus we received in the same CSA bag. If any of you have ever used it and have ideas, please share! I need your wisdom! Homemade Playdough Failure and Success…and a Good Coloring Tip! Today I’m car-less, it’s raining, and I have a ton of work to do. And Anna doesn’t have any school. In anticipation of a pretty boring day for my little 3-year-old, I decided to whip up some playdough for her. 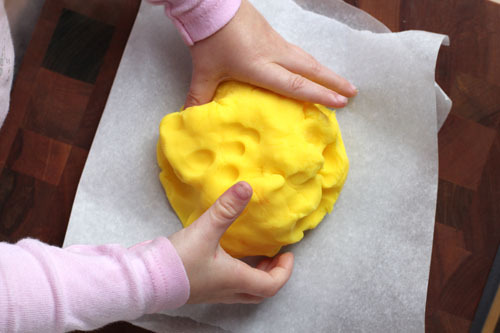 I went straight to Make and Takes and found Marie’s favorite playdough recipe. I trust her. She knows what she’s talking about. Sadly, I scoured my cupboards for cream of tartar and came up empty-handed! I googled homemade playdough recipes to try to find one that didn’t require cream of tartar. I settled on two recipes – one salt-based and the other baking soda-based. Well, the salt-based dough was a total bust. I don’t know if it’s a bum recipe or if I didn’t cook it long enough, but it was super sticky and soft, definitely not a useable dough. Anna decided it just needed to go in the trash, and she was right! The baking soda recipe, however, came out great! It was much faster than the other recipe and it makes a nice maleable dough. And, someone pointed out on Twitter, it’s gluten-free. Nice bonus for those of you who need that. I have no idea how long the shelf-life is, but it’s just baking soda and cornstarch, so I think it could probably keep in the fridge wrapped in plastic and in an airtight container for a while. 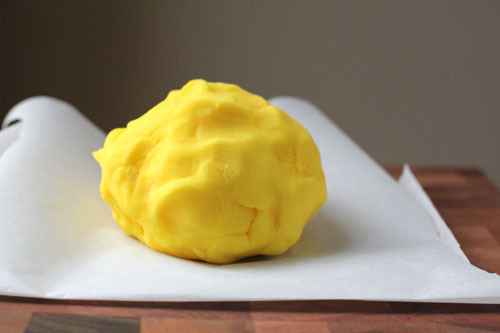 Here’s the fun playdough tip I discovered while searching for recipes. Add your food coloring to the water BEFORE mixing with the other ingredients. This worked so great! Of course, if you want to make multiple colors of dough from one recipe, you would need to add the color after it’s cooked, but if you’re just making one color, dissolving the color in the water was a genius idea. Here’s the recipe we used today. Although, I’m getting some cream of tartar so I can give Marie’s favorite recipe a go one day! Homemade Playdough Failure and Success...and a Good Coloring Tip! Standard recipe; I found it on this site, but I’ve added my own commentary. 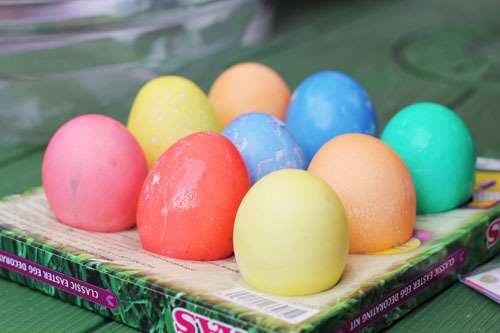 If you’re planning to just make one color of playdough, mix your food coloring into the water. Whisk all ingredients together in a pan. Bring to a boil, stirring constantly with a rubber spatula. Once boiling, you’ll let it cook 2-3 more minutes, until it turns into dough. It’s pretty quick and magical! Turn dough out onto waxed or parchment paper to cool. Cover the top with plastic wrap so you don’t get a dry film on the top while it cools.